Classic Colonial Homes is involved in designing residential and mixed-use town planning projects. Read about some of our recent projects below and contact our office for more information. Thank you. 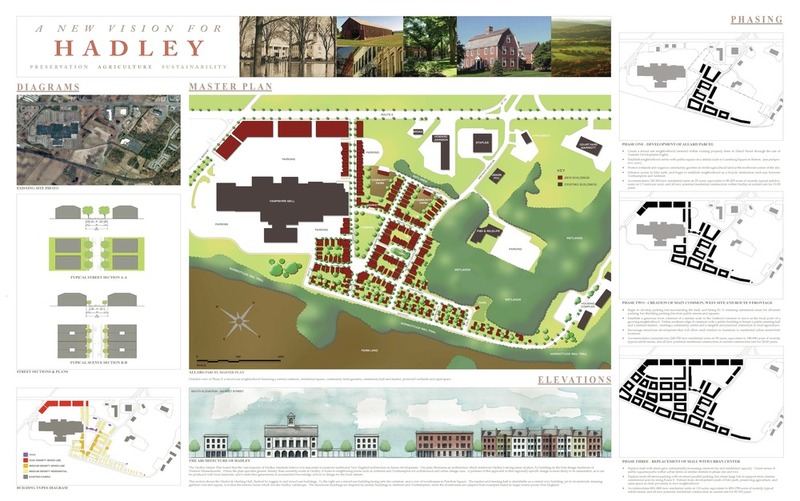 A design team from Classic Colonial Homes, Inc., including Keith T. Kirley, consulting designer Aaron Helfand, and Lance A. Kirley, recently took first prize in the Pioneer Valley Smart Growth Design Competition, announced at Holyoke Community College in Holyoke, Massachusetts. The team also won the competition's "People's Choice Award". The design was chosen from among 23 entries submitted from firms across the greater Northeast and beyond. Classic Colonial Homes' entry incorporated the company's home designs into a mixed-use plan centered around a working organic farm and farmers market. CCH was excited to create an alternative vision for sustainable growth that acknowledged and celebrated Pioneer Valley's agricultural heritage and its important role in the continued success of the region. The Competition was hosted by the Valley Development Council in collaboration with the Pioneer Valley Planning Commission and the Western Massachusetts Chapter of the American Institute of Architects. It was focused on providing smart growth models for sustainable development and redevelopment in the Pioneer Valley region. Note: These are large files which may take some time to load completely.